A grade II* listed building, the theatre was built in 1932 and is an example of Art Deco design. The architects were Bradshaw Gass & Hope; the slightly Gothic features were intended to relate to the adjacent Gothic Revival Town Hall which has since been demolished. It has two auditoriums, an 900-seat main theatre and a small 80-seat studio theatre. Its programme consists of a diverse mix of theatre and music, including a pantomime season featuring star names, stand up comedy, nostalgia shows, drama and children’s theatre. The Theatre started out as a concert hall and was built on top of a disused fire station. It was built as an extension to the Town Hall next door and the architecture was to match it. The new concert hall was officially opened on June 22nd 1932 by the Duke of York. During the 2nd World War the building was used as a ration station, telephone exchange and an air raid shelter. In 1965 the building was officially named Lewisham Concert Hall and performers from all over the UK and US came to put on shows here. 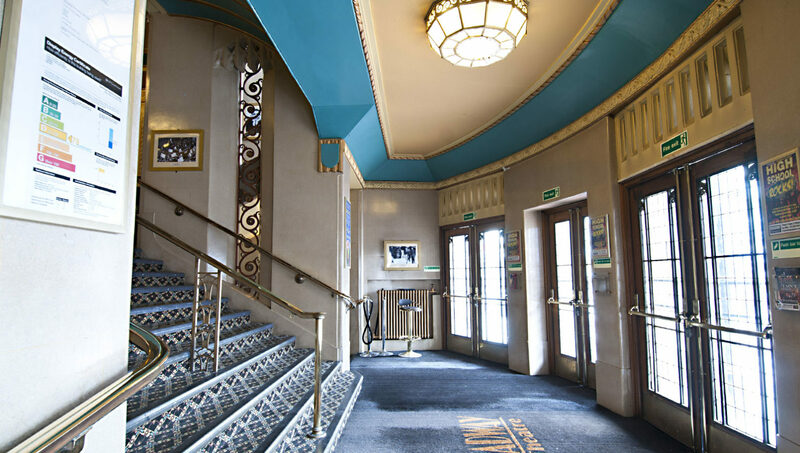 In the 1980’s the concert hall was renamed and rebranded as The Lewisham Theatre and the interior was refurbished with new technology and layout. The old hall was refurbished with cabaret style seating and the ability to seat around 120. The new main auditorium became famous for its comedy performances. In 2001 the theatre had its latest name change and became the Broadway Theatre. The building underwent a restoration and much of its famous art deco architecture and interior was refurbed. The main auditorium has gothic style oak panelling, a curved roof with coffered panels and walls featuring giant round-headed arches. The proscenium arch is flanked by panels surmounted by shields, flanked by heraldic beasts and metal scrollwork grilles as well as the original Compton organ. The Studio performance space was created which was able to seat around 80 and was perfect for smaller productions and had an intimate feel to it. The theatre is entering a new era with the focus on festivals, community projects and live music. In the summer of 2018 Broadway Theatre will host their first ever annual Catford Fringe Festival which aims to attract artists and musicians from all over but especially from the local Lewisham community to perform.